The federal government has declared Sunday as a day of national mourning over recent terrorist attacks in Balochistan and Khyber Pakhtunkhwa. ISLAMABAD, Pakistan — A string of violent attacks at political rallies, killing nearly 160 people this week, has the nation on edge about security for the upcoming national elections, with some political leaders blaming the Pakistani government for not doing enough to protect the electoral process. On Saturday, bloody images of one of the attacks — a bombing on Friday at an election rally that in southwestern Baluchistan that killed 132 people and injured 500 more — percolated through TV news channels and social media, harking back to the 2013 national elections that were also marred by suicide bombings that killed scores of people. The violence prompted the government to declare Sunday as a national day of mourning, while the leader of one of the country’s three major parties — the Pakistan People’s Party — announced he would suspend campaign activities for two days out of respect for the victims’ families. With tensions already high over the July 25 election, leading Pakistani newspapers and political commentators called on the nation’s military to beef up its counterterrorism efforts and for government security forces to do more to ensure a peaceful democratic transition in the nuclear-armed nation. The attacks seem geared toward thwarting the election, which pits former prime minister Nawaz Sharif’s ruling Pakistan Muslim League party against former cricket star Imran Khan’s Pakistan Justice Movement for control of the National Assembly in what could spell the downfall of one of the country’s premier family political dynasties. In Baluchistan, near the border with Afghanistan, the Islamic State claimed responsibility for Friday’s suicide bomb attack at a rally held by the Baluchistan Awami Party, which is seen as pro-military. Nawabzada Siraj Raisani, a candidate for a provincial legislature seat in the Mastung district, was among those killed. Earlier Friday, four people were killed in an attack in southern Pakistan, in the city of Bannu, near a rally held for Akram Khan Durrani, a leader in the conservative Jamiat Ulema-e-Islam party that supports the Pakistan Taliban. Durrani, a candidate for the National Assembly, was uninjured in the attack. No group has claimed responsibility for the attack. And, in Peshawar on Tuesday, 21 people died in a Pakistan Taliban suicide bomb attack at a rally held by the liberal Awami National Party for Haroon Bilour, a candidate for the provincial legislature. Bilour was among the dead. Ayaz Amir, a former National Assembly member who is now a political analyst in Islamabad, said the government should restrict large political gatherings until after the election. Others called for a unified front against terrorist attacks amid the political turmoil that already exists over Sharif’s corruption case and his return home Friday to begin a 10-year sentence after he and his daughter Maryam Nawaz were found guilty of illegally hiding their money in London apartments and other offshore properties. “In order to get rid of these remnants of terror, there is a need of cohesion between the government, the security agencies and also the political parties,” said Ali Zafar, minister of information for the caretaker government put into place after Sharif was stripped of his role as prime minister last year. But that spirit of cooperation seemed unlikely Saturday after police in Lahore charged Sharif and others in his party with inciting violence, following skirmishes between security forces and his supporters during a rally held in that city the day Sharif’s plane arrived from London. The ex-prime minister’s younger brother said the party will fight those charges and will attempt to have Sharif and his daughter released from prison, as they face another trial on separate corruption charges. “We will opt for all legal options to defend Nawaz Sharif and his daughter,” said Shahbaz Sharif, the party’s president, calling on supporters to hold peaceful protests on behalf of his brother and niece. Ijaz Khattak, a political analyst in Peshawar, said the military has been too distracted by the Sharif family scandal, at the expense of public security for others. Moeed Yusuf, vice president of the Asia center at the United States Institute for Peace, said the attacks have undermined the conventional belief among Pakistan analysts that this year’s elections would be more secure than they were in 2013, especially after the army announced its plan to post 371,000 soldiers at voting stations on election day. QUETTA: Pakistan Tehreek-e-Insaf (PTI) Chairman Imran Khan has termed the Mastung bombing a conspiracy to delay the elections. Speaking to the media during his visit to Quetta, the PTI chief said, "Pakistan's internal and external enemies are behind the Mastung attack,". A total of 131 people were killed after a suicide bomber struck Nawaz Siraj Raisani's election meeting in Darenghar area of Mastung. Imran criticised the lack of implementation of the National Action Plan for the continuation of terrorism in the country after 2014. "We will not postpone elections since that is what the enemies want," he stated further. He then criticised the rampant corruption in the country and the role of the last federal government in allegedly rigging the 2013 general election. The PTI chief reached Quetta earlier today to express solidarity with the families of Mastung victims as the country observed a day of national mourning. Imran, accompanied by party spokesperson Naeemul Haque and other members, visited CMH to inquire into the health of those injured in the incident. He later visited the Raisani family at their home to offer condolences. Raisani, the brother of former Balochistan chief minister Nawaz Aslam Raisani, was a Balochistan Awami Party (BAP) candidate from PB-35 constituency. Over 100 people were also injured in the attack, 59 of which are still in hospital and five of whom have been shifted to Karachi via a military plane owing to their critical condition. Investigations are under way into the attack, with an FIR registered on terrorism charges and Mastung Tehsildar Buland Khan assigned as the investigating officer. Imran is also scheduled to campaign in three cities of Punjab today for the upcoming polls. The cricketer-turned-politician will stage rallies in Faisalabad, Jhang and Sialkot. Imran will kick off his electoral campaign for today from Jhang where he will address supporters at Mai Heer Sports Complex at 3:00pm. He is then scheduled to visit Faisalabad where he will speak to a gathering at Dhobi Ghat Ground. The third PTI rally scheduled for today will be held at 8:00pm at Sialkot’s Jinnah Stadium. Preparations for all three rallies are underway and security has been tightened around the venues. “The party has decided to postpone the rally owing to security concerns,” Matiullah Khan said. QUETTA: Pakistan Muslim League-N President Shehbaz Sharif said on Sunday that Pakistan Tehreek-e-Insaf Chairman Imran Khan should refrain from doing politics at the time the country is reeling from the Mastung tragedy, which claimed 131 lives and wounded several others. Shehbaz reached Quetta today, where he spoke to media after offering condolence for Nawabzada Siraj Raisani and others, who were martyred in a recent suicide attack in Mastung. He said that the entire nation is in mourning and the PTI chairman ‘should be ashamed for making allegations’ at a wrectched time. The PML-N president said that if the elections procedure was to make controversial then irreparable loss would be faced. Neither PTI nor PML N were even planning to visit Balochistan during this election rally. It is sad that it took the death of so many innocent Pakistanis for them to realise that Balochistan is also part of Pakistan. PESHAWAR: A senior leader of the Awami National Party, Ghulam Ahmed Bilour, has hinted at involvement of “our own people who have benefited from my nephew’s murder”, not Taliban, in the suicide attack on an election meeting in the Yakatoot area of the city on July 10, which killed Haroon Bilour and 19 others. Ghulam Ahmed Bilour, the eldest uncle of Haroon Bilour, who is contesting the election from NA-35 constituency and had himself survived a suicide attack a few years ago, made this claim while talking to a reporter of a private channel. Mr Bilour told the reporter that Taliban had claimed responsibility for the suicide attack on his nephew, but he thought otherwise. The 78-year-old Bilour claimed that he had evidence suggesting that Taliban were not involved in the attack. But instead of giving reasons or proof on the basis of which he gave the statement, he just recited some verses suggesting that it was an inside job — a treacherous murder committed by those who were immediate beneficiaries of the killing. The ANP leader said that his party’s struggle would continue and it would field a candidate in the by-election on PK-78, from where Haroon Bilour was a candidate. The ANP would certainly win the constituency, he added. Mr Bilour’s statement is contrary to what was initially believed as the banned Tehreek-i-Taliban Pakistan (TTP) had claimed responsibility for the suicide attack targeting Haroon Bilour immediately after the incident. The TTP cited targeting of its men during the ANP’s previous five-year rule in Khyber Pakhtunkhwa as the main reason for such attacks. In the past, a claim similar to Ghulam Ahmed Bilour’s was made by the family of former provincial law minister Israrullah Gundapur after he was killed in a suicide attack on Oct 16, 2013. Dawn was unable to get into touch with ANP Secretary General Mian Iftikhar Hussain and Information Secretary Zahid Khan to get their version on Mr Bilour’s remarks. Malak Ghulam Mustafa , a close companion of Haroon Bilour and the ANP’s Peshawar district president, did not endorse Ghulam Ahmed Bilour’s statement and said no discussion on the claim had taken place during a meeting of the district chapter of the party. We should make COAS the Chief of Twitter. Would be more suited to his condemning abilities. Balochistan is bleeding again but all our Fouj can do is tweet to express its dismay. The suicide attacker who killed at least 150 participants of a corner meeting last Friday in Mastung district of Balochistan has been identified as Hafeez Nawaz, a member of outlawed Lashkar-e-Jhangvi (LeJ), who hailed from Abbottabad but was living in Sindh’s Thatta district for many decades. “A hand of the bomber was found from the blast site which led us to his identification as Hafeez Nawaz, son of Muhammad Nawaz. He hailed from Abbottabad district of Khyber-Pakhtunkwa but lived in the Sakro area of Thatta in Sindh,” said the Counter Terrorism Department (CTD) DIG Aitzaz Goraya on Wednesday. Goraya was addressing a press conference with regard to the Mastung suicide blast in which the Balochistan Awami Party (BAP)’s candidate for provincial assembly Nawabzada Siraj Raisani was apparently the target. More than 200 were also injured in the atrocity. “Initial Investigation and evidence reveal that after joining the terrorist group Hafeez along with his brother and sisters left for Afghanistan and had been living there for the last two years. “Intelligence agencies are investigating Hafeez’s activities in Afghanistan. The CTD Karachi helped us in tracing his family background,” he added. 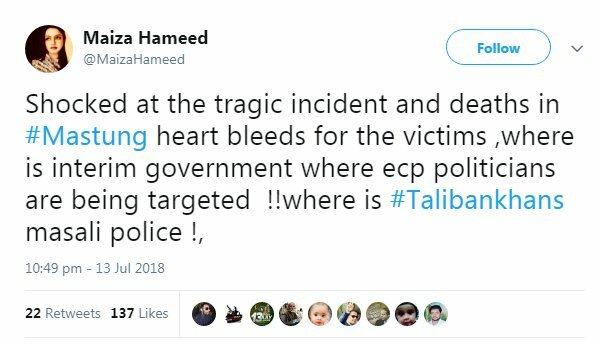 Sharing details of people who helped the suicide bomber reach the corner meeting, the CTD official said ‘some local people’ in Mastung provided him shelter and facilitated him to reach the place where Raisani’s corner meeting was taking place but rejected reports of arresting two facilitators. To a question regarding Da’esh claim with regard to Mastung blast, Goraya said it has been noticed that two or more groups simultaneously claim responsibility for a blast. This also happened in the case of 2016 Civil Hospital and Quetta Police Training Centre attacks. “The LeJ is working under the umbrella of ISIS (Da’esh) and both terrorist organisations have been facilitating each other in carrying out attacks in Balochistan,” he said. He said the CTD, Frontier Corps, police and other law enforcing agencies (LEAs) have been investigating the blast and intelligence based operations (IBOs) are being conducted to arrest the facilitators. He urged people to share any information on the blast but appealed to the media and social media users not to spread false news. To a query about the Punjab Forensic Laboratory investigators who visited the blast site a few days back, the DIG said the forensic teams have been investigating the blast from all aspects and details of explosive material used in the suicide attack will be shared. My word. No wonder why was she always there on tv defending shareefs corruption. Apparently a dump person like her would hv no career outside pmln, a party that has no dearth of people like her. I wish there was an interview for these dumb people before joining parliament. KARACHI: The man who blew himself up at a Mastung election rally on July 13 and killed nearly 150 people, including Balochistan Awami Party candidate Siraj Raisani, was a student at a seminary in Karachi before being shifted to Afghanistan along with his family, where he got militancy training, it emerged on Friday. The alleged suicide bomber has been identified by authorities as Hafeez Abbasi, a young man in his early 20s. Sources in the Sindh police’s Counter-Terrorism Department told Dawn that their counterparts in Balochistan had shared with them a preliminary report of the suicide explosion and they carried out further work here. The CTD-Quetta had provided fingerprints of an unclaimed body to the CTD-Sindh to match it with the record of the National Database and Registration Authority. It transpired that the alleged suicide bomber was a resident of Gharibabad Mohalla in Dhabeji, Thatta. A special CTD team was immediately sent there on July 17 and to their utter surprise, his father, Mohammed Nawaz, without any hesitation told them that his son Hafeez had been shifted to Afghanistan’s Spin Boldak area. Mr Nawaz, who is living with another son, Haq Nawaz, in Thatta also told the CTD team that not only Hafeez but his wife, his two other sons and three daughters had also been shifted to Afghanistan. The family originally hailed from Molia village in Abbottabad. They said that Abbasi had studied at a seminary in Shah Faisal Colony for three years where he adopted the path toward militancy. His certain colleagues at the seminary were instrumental in motivating him towards militancy and they allegedly sent him to Afghanistan. The sources disclosed that as per information provided by his father, his three daughters, who had been shifted to Afghanistan, were ‘Alima’ (religious scholars) and two of them had married IS militants there. His two more sons, Abdul Aziz and Abdul Shakoor, were also living in Afghanistan, they said, adding that Shakoor recently told his father that now “it’s his turn” to become a suicide bomber, said the sources. Abbasi’s eldest sister was married and lived with her family in their hometown in Abbottabad. The suspected bomber’s father along with his son used to sell milk and vegetables in the Dhabeji area. The CTD sources said that the father did not show any remorse or express any feeling of sadness when they informed him that his son had carried out a suicide attack in the Mastung rally. The father told the CTD that Abbasi was working with Haji Daud there. A CTD official told Dawn, on the condition of anonymity, that Haji Daud, also known as Daud Policewala, was a policeman in Karachi till mid-2000. He was also appointed as the city chief of the banned Tehreek-i-Taliban Pakistan (TTP) by now slain Mullah Fazlullah. The official said they got reports that Haji Daud had developed differences with Mullah Fazlullah as he joined the militant Islamic State group. He was also reportedly injured in a clash with TTP militants there. The sources said that the CTD officials got the mobile phone number of Hafeez from his father and by using latest technology they came to know that he had arrived in Chaman from Afghanistan on June 29. He was also in touch with at least nine persons, including three belonging to Sindh, they added. The alleged bomber was later moved to Qila Abdullah and subsequently to Mastung, where he had carried out the suicide attack on Siraj Raisani’s election rally. The CTD-Sindh informed their counterparts in Balochistan about Abbasi’s alleged handler in Qila Abdullah and his local facilitator in Mastung. In Karachi and Thatta, the sources added that law enforcement agencies conducted raids and made “some important arrests”. A CTD official feared that Abbasi’s younger brother Shakoor, who is a teenager, might carry out a terrorist attack. The official, who wished not to be named, told Dawn that they had arrested some members of the IS network in Karachi. He added that concerted efforts were under way to ‘dismantle’ the group before it could strike again in the country. The CTD official believed that IS was “actively flourishing and being patronised by foreign intelligence agencies” in Spin Boldak “to sabotage the election process, trigger destabilisation in the country and to mainly target CPEC [China-Pakistan Economic Corridor- related activities”. The irony is that they don't even contest elections and come on reserved seats. I fully support Imran view that there shouldn't any reserve seats for women and they should contest in general elections. Absolutely makes no sense that you get to represent or misrepresent people who don't choose you in the first place. If anything they shd hv certain seats on rational basis where only women can contest elections. Last edited by shaaik; 22nd July 2018 at 14:59. KARACHI: Police say they have arrested the father and brother of the suicide bomber behind the July 13 terrorist attack in Mastung that killed 149 people including election candidate Nawab Siraj Raisani. The duo was arrested in an intelligence-based raid by Counter Terrorism Department at Banaras area, SSP Counter Terrorism Department Pervaiz Chandio said at a press conference here on Friday. Meanwhile, separate raids were conducted by the law enforcement personnel in Manghopir and Old Sabzi Mandi areas on the immediate information given by the arrested individuals. "In the raids two more facilitators of the sucide bombers were arrested. Suspects Shiraz and Wali Ahmed were trained in Afghanistan and Panjgaur," SSP CTD Chandio said.